Oh boy. This Panna Cotta has got me all sorts of giddy. I love, love, love lemon. Lemon is life in my little piece of the world. My only contention with lemon-flavored desserts is when they’re too sugary. It overpowers the tartness of the lemon & I don’t want anything overpowering my lemon love. Making a dairy-free panna cotta is quite simple! I replaced the traditional heavy cream with a light coconut milk (you can use full-fat too) pureed with a bit of white sweet potato. 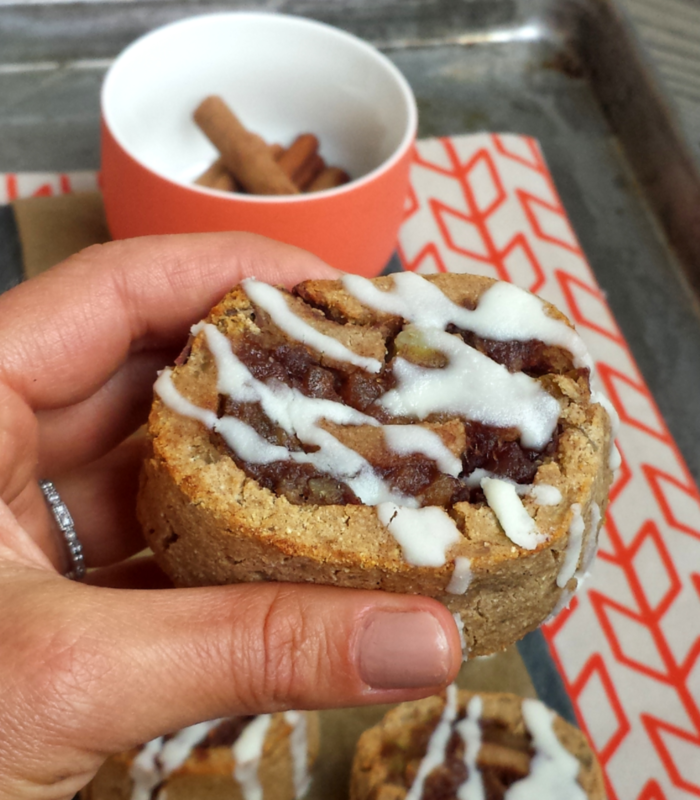 I tend to use white sweet potato in the vast majority of my desserts. I’m very sorry if you can’t find it. I wouldn’t recommend orange sweet potato here – the taste is too distinct. White-fleshed sweet potatoes provide a touch of sweetness, thickness and binding power to AIP and egg-free desserts. These creamy little custards make for the perfect springtime or year-round treat! 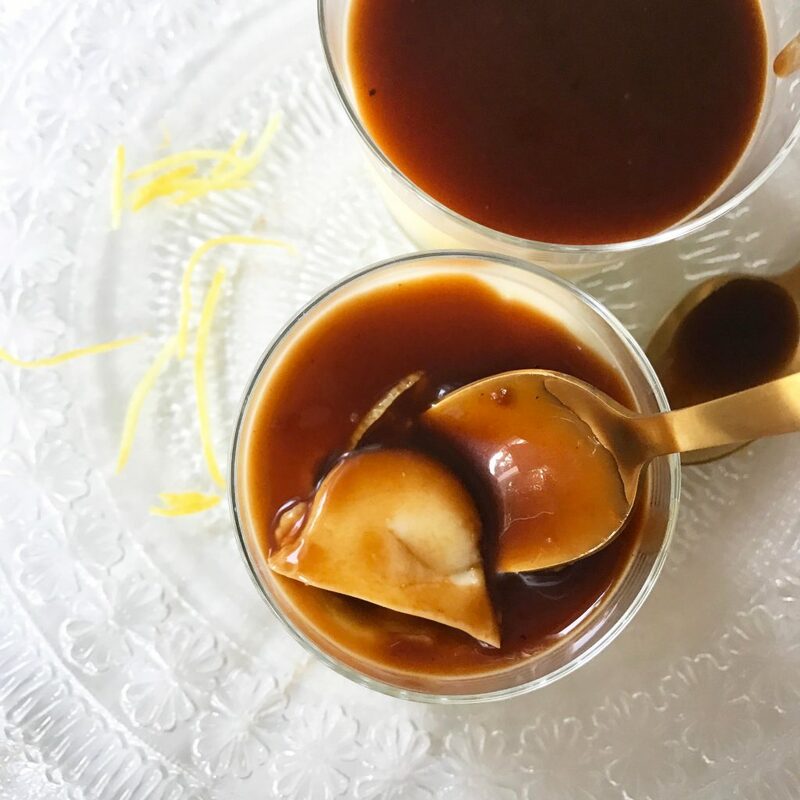 They are relatively low in sugar (especially if you choose to make them without the caramel sauce), silky smooth & super satisfying. 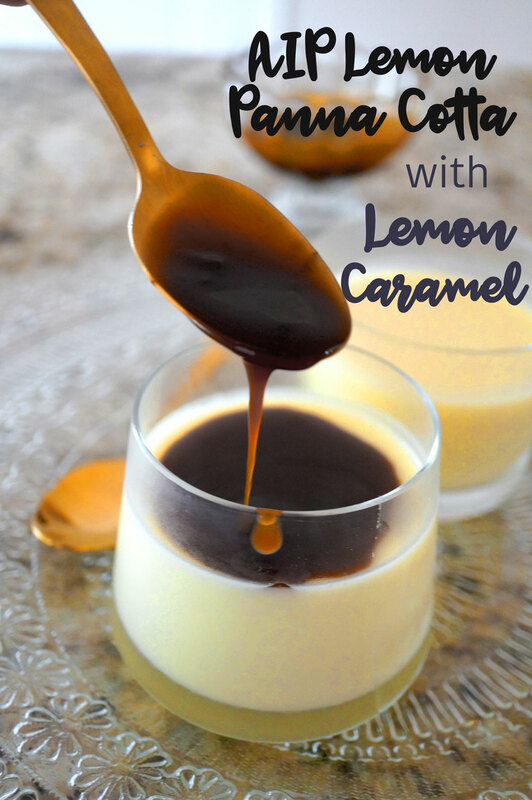 The Lemon Caramel sauce is really easy to make too. 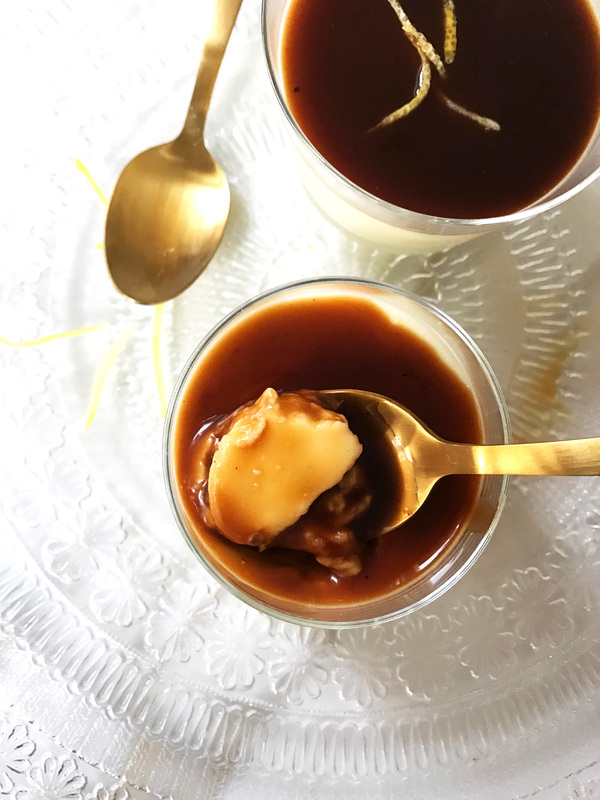 Making caramel is a lot of fun and can be made relatively quick with my method below. 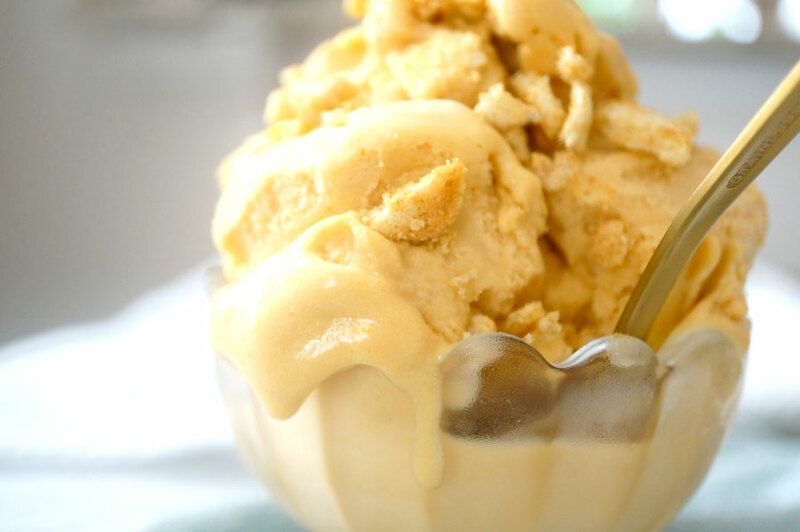 The tartness and sweetness of the caramel is absolutely gorgeous with the custard. 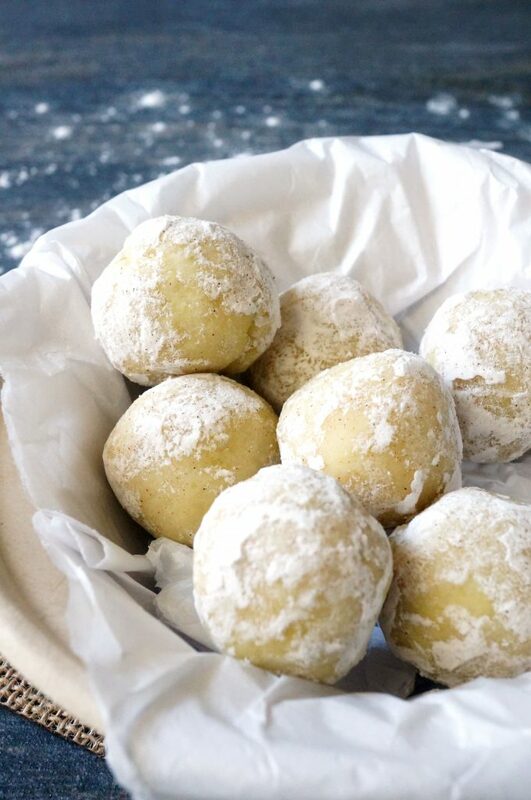 You may also top your mini treats with some lemon zest for presentation. 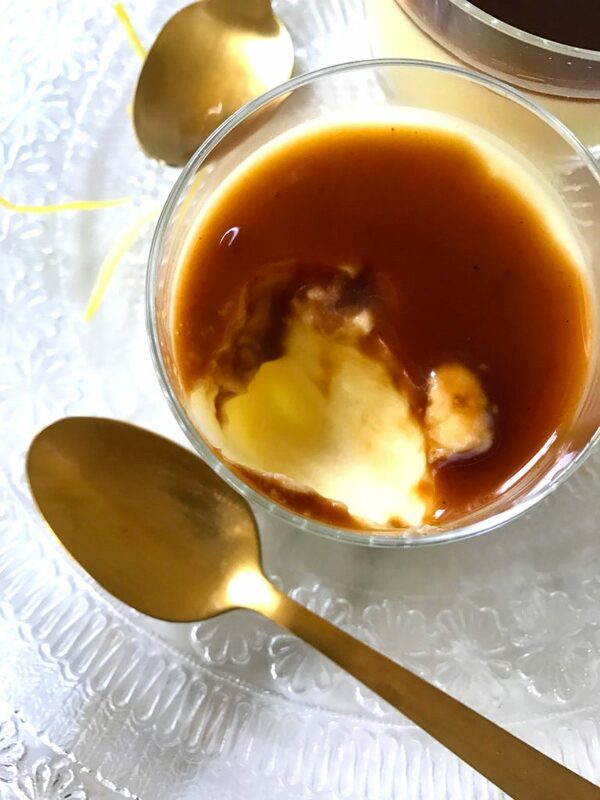 These panna cottas are silky smooth, perfectly tart & paired with a dreamy lemon-flavored homemade caramel sauce! Reserve 1 tablespoon coconut milk in a small bowl. Set aside. Combine remaining coconut milk, lemon juice, honey and sea salt in a food processor until smooth. Whisk gelatin into reserved coconut milk until frothy. Whisk in hot water until combined. Immediately spoon gelatin mixture into food processor and blend until smooth. Finally, add warm sweet potato the food processor and blend until very smooth ensuring no chunks remain. Spoon panna cotta mixture evenly into 4 small glass dishes or ramekins. Refrigerate for 4 hours or overnight until fully set. Spoon cooled caramel on top when ready to serve. Combine all ingredients for caramel in a small saucepan set over medium heat. Bring to a simmer and then reduce heat to medium-low. Maintain simmer for 20 minutes as you periodically stir the caramel and scrape any browned bits off the bottom and sides of the pan. Remove caramel from heat once it has reduced to a thick brown syrup that sticks to the back of a spoon. Transfer caramel to a small glass dish and let cool and thicken. 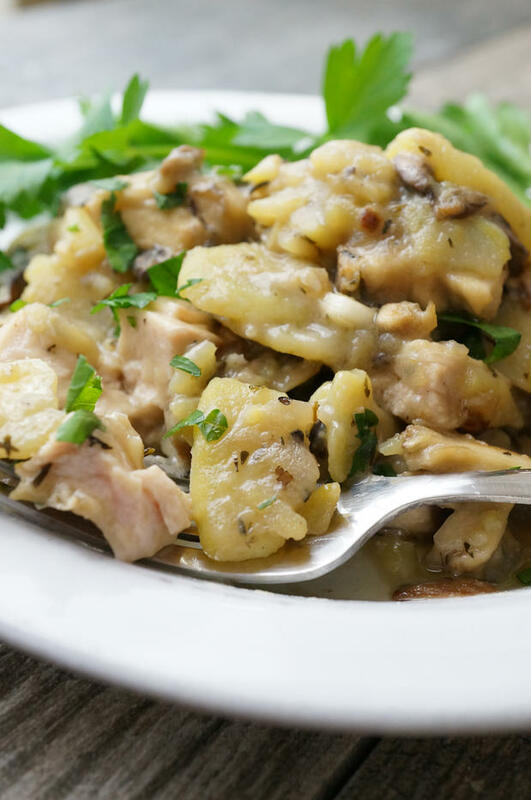 This recipe may be one of my all-time best – especially when it comes to how much flavor is packed in such a simple preparation! 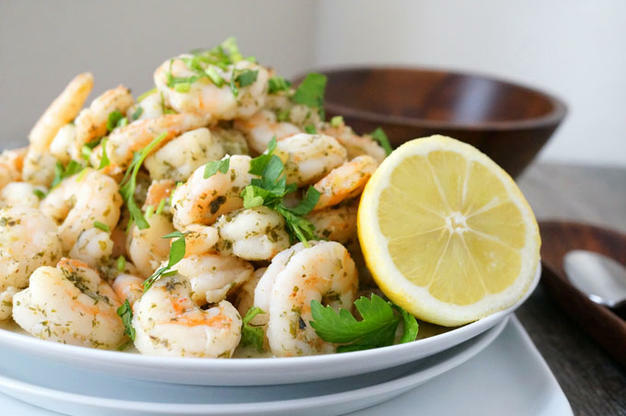 While I have a delicious dairy-free avocado tzatziki recipe in The Healing Kitchen, I wanted to make a more traditional version to pair with these stellar sauteed shrimp! If you can only find almond milk yogurt and tolerate nuts, then feel free to use in place of coconut milk yoghurt! Coconut yogurt (co-yo) is very easy to make but takes a bit more time than just swiping some off the grocery store shelf. There is a recipe included for coconut yogurt from my friend Laura at Sweet Treats (here it is). 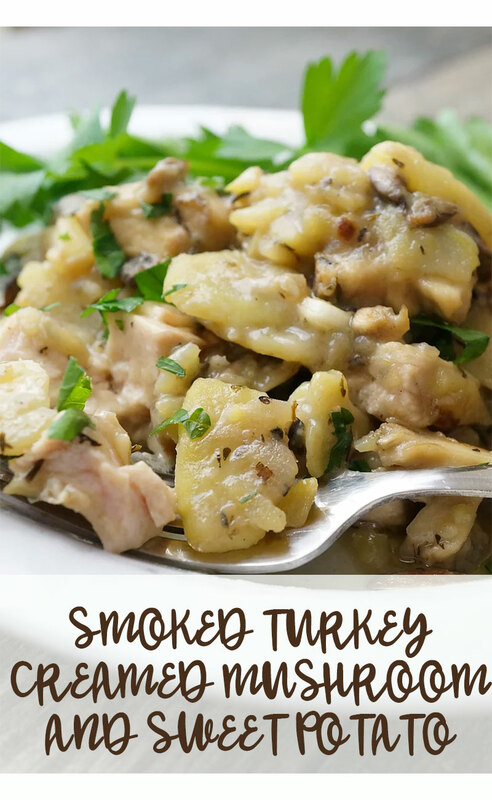 If you really want to make this a quick & extra easy recipe, then you can also use Primal Palate Super Gyro seasoning, which is a 100% AIP-Friendly seasoning from the Paleo power couple. 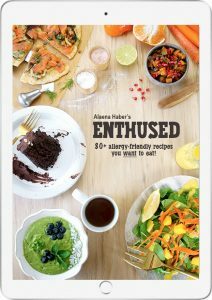 It is SO delicious and so are the rest of their AIP-friendly seasonings in the AIP Spice Pack! 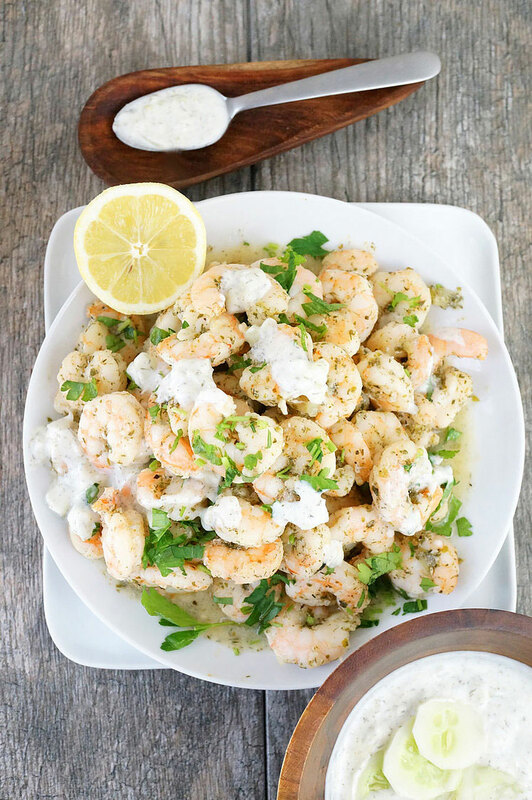 GET THE RECIPE FOR HERBED SHRIMP WITH DAIRY-FREE TZATIKI! My favorite cooking gadget that I didn’t really “need” but HAD TO HAVE has been sitting unused for the past 7 months! The Whynter Stainless Steel Ice Cream Maker isn’t a cheap “Hey, might as well at that price” kind of purchase. My husband bought it for me for my 27th birthday after I had been asking for an ice cream maker for years but didn’t want to deal with the hassle of the freeze-ahead models that cost much less. I think he also was hoping I’d make ice cream every night for dessert if he got it for me. I don’t think my tummy can handle that much coconut milk though, and during my pregnancy if the craving for coconut milk ice cream has hit, there’s been lots of local places near me that can heed my craving! Here’s the list of coconut milk ice creams I’ve tried since we’ve moved to Austin. 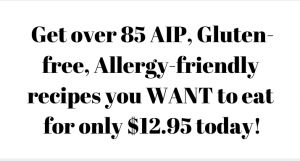 They aren’t AIP since they contain cane sugar or agave (and sometimes chocolate) but all the flavors I’ve had are gluten-free, dairy-free, egg-free and soy-free! Lick Honest Ice Creams: My husband really likes this place. I think it’s okay. The customer service experience is always odd. The ice cream is really creamy though but the kids behind the counter are always confused about the ingredients. They say their chocolate flavors are soy-free. Nada Moo (store-bought): Definitely yummy in a pinch! 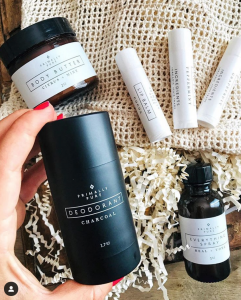 Not the cleanest ingredients (gums, agave). The best flavors are Chocolate and Mint Chocolate Chip. The Maple Pecan tastes like gasoline. Sweet Rituals: basic ice cream flavors but very creamy (they use a gum in their ice cream to emulsify it but no egg) and you can get toasted coconut as a topping! Thai Fresh: my favorite by far because you can get a cold scoop of coconut ice cream over a warm ball of sweet and sticky rice – Thai Coffee, Thai Basil, & Lavender are my favorites! They say their ice cream is coconut milk and organic cane sugar with the flavor additions. They usually have 10 dairy-free flavors! Fat Cats: This one has a HUGE selection of coconut milk ice creams and toppings like coconut whipped cream and vegan salted caramel! I don’t know if it was the large serving size or what, but I got a tummy ache from their ice cream and my digestion was off for a few days – may have to try again to see if it was an off-day for me. Organic strawberries have been on sale at Whole Foods for a couple weeks, and they reminded me of my Strawberry Milkshake from The Healing Kitchen! I based this ice cream recipe on that super simple “milkshake” recipe with some minor tweaks to make it creamier. The white sweet potato acts as the emulsifier to decrease the amount of water crystallization in the recipe caused by the freezing of coconut milk (which is 30-40% water). I don’t suggest leaving it out. I also don’t suggest complaining about how you can’t find white sweet potato. I have zero ability to control the distribution of white sweet potato to your town. Orange sweet potato would be disgusting here. 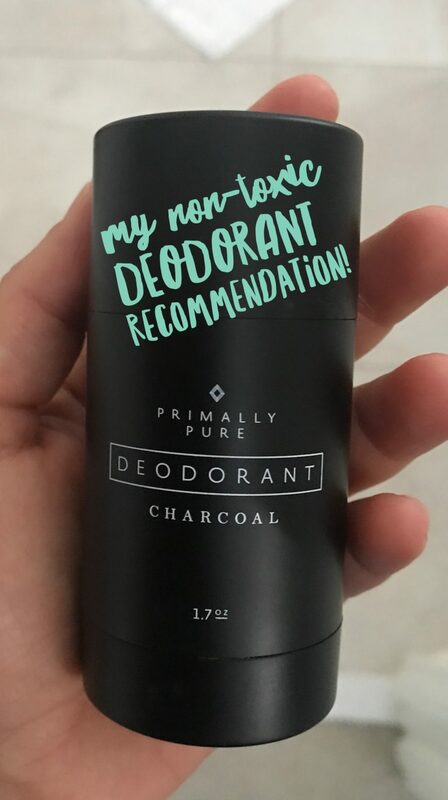 Don’t even think about it. 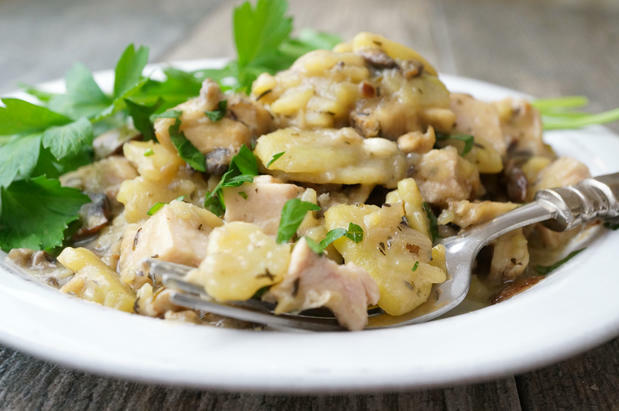 You can try parsnip (not as flavorless as white sweet potato though), raw egg yolks if tolerated, or a couple tablespoons of gelatin (not as creamy) in its place. 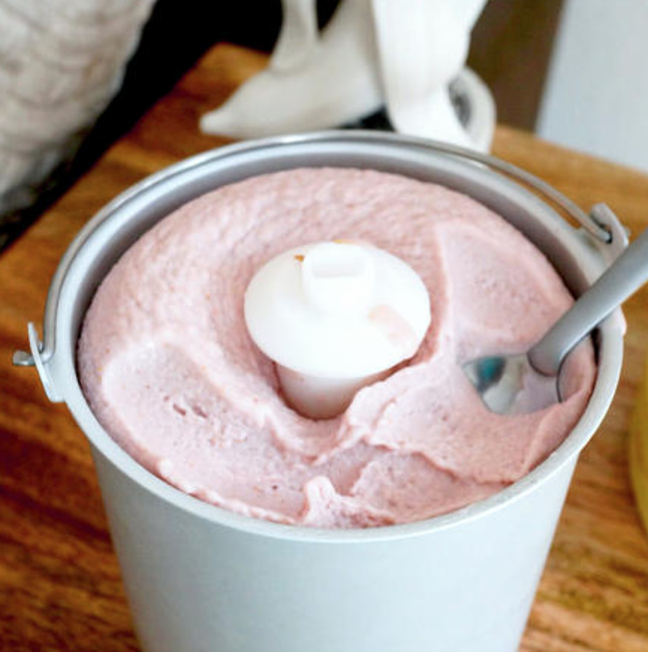 Enjoy this creamy, dreamy fruit-based non-dairy ice cream! 1. In a high-powered blender, combine all ingredients until smooth. Taste and add more sweetener, vanilla or sea salt to your liking. I have been craving Sucre a La Creme lately but it is incredibly difficult to achieve it’s texture without butter, white sugar, and real cream. Instead, I decided to make Caramel Fudge which has just as rich of a flavor as my childhood favorite, but MUCH less sugar! Basically, I made a simple caramel sauce out of coconut milk, maple, coconut sugar, and vanilla. Then to thicken it up, I added coconut butter and coconut oil (which provides some firmness), and the result was perfectly smooth, chewy, decadent, and rich Caramel Chews OR Caramel Fudge (soft fudge, not hard flaky fudge which is what Sucre a La Creme is) depending on how long you freeze it. Good Sucra a La Creme will crumble as you bite into it, leading a trail of gluttony and shame in its wake. It literally has 2 to 3 cups of sugar in it per tray. Cwwwaaazzzy. 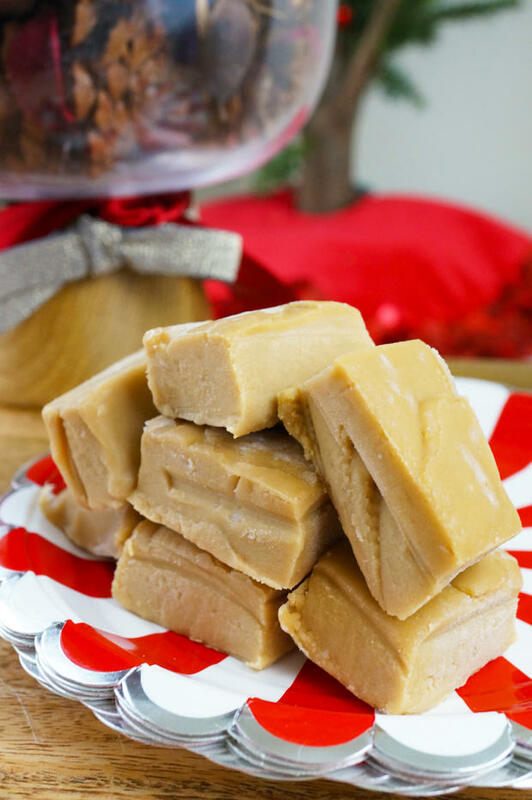 I’m not going to give up on my hunt for the perfect traditional Canadian maple fudge recipe but until then, this recipe was too delicious not to post! 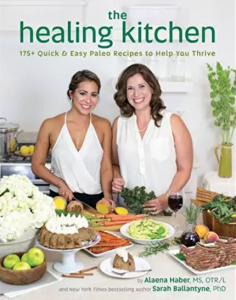 You can use either light coconut milk (I did this to save on calories because yes, I am one of those people who thinks balanced eating includes some sort of acknowledgment of caloric value) or full fat coconut milk (which would probably be even creamier). Next time I would like to top mine with flaked sea salt because flaked sea salt has the ability to make my knees quiver. I also suggest cutting the fudge into small squares because 1 is definitely enough. I had 2 and was like… nope… ONE, ALAENA. ONE. I’m very sensitive to sweets though, so your blood sugar may be able to handle 2. I can’t even have a chocolate chip cookie without feeling queasy. It’s a tough life. I used to be able to handle 1/2 a container of ice cream. What in the world has happened to me? Do you mean to tell me my body only wants to eat meat & vegetables these days? Yes I do mean to tell me that. But that doesn’t mean I won’t be having treats this Christmas! I will be making my Avocado Carob Fudge Bars (definitely my most unique, delicious, and addicting treat on this site!) and my Peppermint Fudge (with chocolate instead of carob this year) because my family is always requesting both of those! 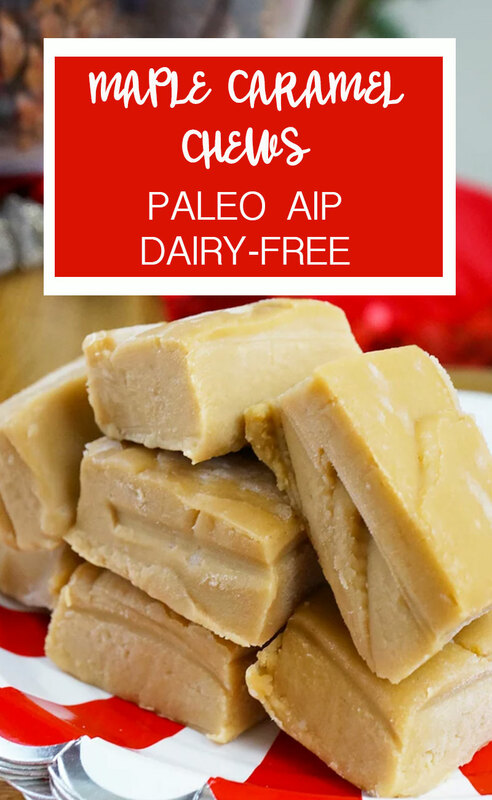 Chewy soft dairy-free caramels with just a few ingredients!? Combine coconut milk, syrup, sugar, vanilla, and sea salt in a small saucepan over medium heat. Bring to a low simmer, whisking every couple minutes until this happens, then turn the heat to medium-low to maintain a simmer for 12 minutes. Continue to whisk every couple minutes as it simmers. The sauce will thicken slightly during this time but will remain rather liquidy. Remove the saucepan from the heat and stir in the coconut butter until smooth and thickened. Now stir in the coconut oil until well combined. Line the bottoms and sides of a 7"x5" glass dish such as a Pyrex container with parchment paper. Pour the caramel into the parchment-lined dish and smooth. Follow the directions below depending on whether you want to make caramel chews or caramel fudge. Store in the freezer until ready to serve for best texture.